You don’t have to be handy or break the budget to bring a tired kitchen back to life! Try a mini-makeover to brighten, lighten and freshen the space. You know that down the line you’ll need to take on a kitchen renovation if you plan to sell your home. If that’s not in your immediate plans, or your budget, there are little projects to spruce up a tired, worn kitchen without the expense and chaos of a full re-do. Get big bang for your buck and make the kitchen fresh and fun again, with a small investment of time and labour. Dark, dated cabinets make a kitchen feel cave-like. If the frames and cabinet doors are structurally sound, renovate — with paint! Scrub them down, lightly sand the surface and brighten things up with a fresh coat of paint. Since cabinets take up so much volume in the room, this one project makes a huge impact. If your dishes are pretty or vibrant, why tuck them away behind closed doors? There are kits available at home improvement stores that make it easy to assemble simple slotted storage. Paint your plate rack to match the cabinets. Your dishes and pottery will add a splash of colour and you’ve freed up valuable hidden storage space. Task lighting is easy to retrofit under most existing cabinets and brightens countertops. You’ll appreciate the extra wash of light when chopping veggies or reading a recipe! While you’re thinking of lighting, switch out the dated overhead for something sleeker. Replace dated handles and drawer pulls — nice choices are modern brushed nickel or rich bronze. For a vintage kitchen, an eclectic selection of ceramic and glass knobs and pulls are a good option. 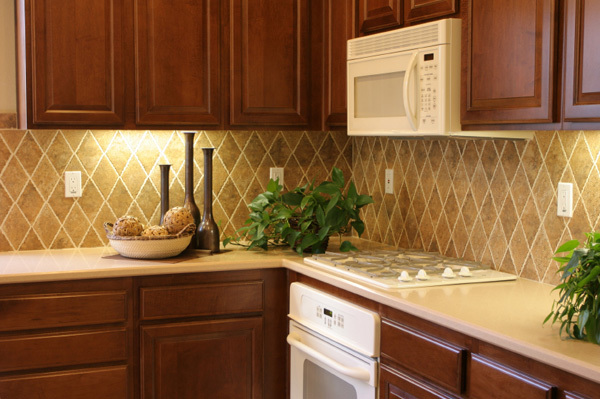 If you’re not eager to mess with tile and grout, there are still inexpensive updates for a backsplash. Add bead-board panels painted in a complementary colour, or use peel-and-stick metal tiles — they come in copper and stainless-steel finishes and are available in 3 x 6-inch subway-tile format to fit with most decors. A coat of paint revitalizes the look of older appliances and it’s actually a fairly easy project. Lightly sand the appliance so paint will adhere. Cover the handles and hinges with masking tape to shield, then spray two coats of Krylon’s Epoxy Appliance Paint or stainless steel paint. It will cost about $30 for enough paint to cover the average refrigerator. Sew up simple cafe curtains from terry tea towels or add wooden blinds or a roman shade. Press-and-stick tiles inexpensively cover outdated and worn laminate flooring. Try a variation on traditional black and white checkers by creating a striped pattern with alternating colours, or go for a neutral tone in simulated stone. Now add in your accessories — plants, baskets, fresh and bright teatowels — and enjoy your new space!